Head south from Lawrenceburg pass through Rising Sun. Turn south onto Dibble Road and get out of the car. You’ll find yourself in the midst of vast swaths of wildflowers – and the newest Oak Heritage Conservancy nature preserve. Chrys Cook, an OHC Board Member, had been watching the property for two years. She knew this place was special: it was home to more Monarch butterflies than anywhere else she’d visited in southern Indiana. Monarch populations have been plummeting for years, so finding a place where they thrive is unique. When she learned that the property was up for auction and, likely, development, she realized that OHC might be ready to help. After careful consideration, visits to the land, and lengthy conversation, we decided to try to raise the funds needed and purchase the property. This was unusual, as we normally create preserves when landowners donate land for future generations to enjoy. But this place was unique: we knew from Chrys’s visits that Monarchs regularly visited the property and that it offered just what the Monarchs need. Monarch butterflies migrate through the Midwest each year, and need a few specific things to survive along the journey. 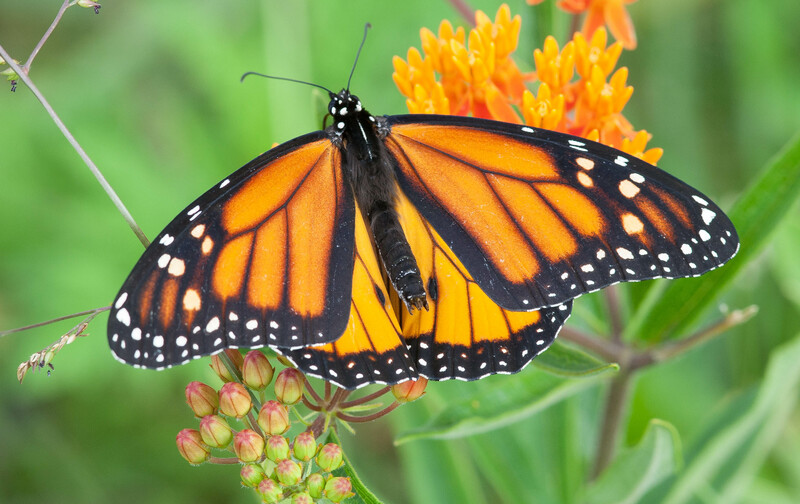 First, they need native flowering plants like Butterfly Weed that provide nectar for them to eat. This food source is critical to their long migration. Second, they only lay their eggs on milkweed plants. The migration includes multiple generations, so they have to have places in Indiana and throughout their flight path to raise a new generation of butterflies. The property on Dibble Road hosts an ideal combination both large patches of Butterfly Weed, a source of food for the adults, and milkweed, where Monarchs can lay eggs and caterpillars can thrive. Unfortunately, we only had three weeks before the auction. We calculated that we needed approximately $250,000 to purchase the property. Longtime supporters Josie and Geoff Fox offered up a generous idea: their foundation could match every contribution 4:1, up to $50,000. If we could secure $50,000, we could go to the auction prepared to purchase the land. Donations streamed in from across the country, including Michigan, New York, and California. Most of the donations, though, came from here in southeast Indiana: some from folks who are members year in and year out; some from people who used to be OHC members but hadn’t renewed their memberships in years; and some from people who were new to OHC. Clearly, lots of people share our passion for protecting the Monarchs and creating nature preserves for future generations. “Community support fueled the effort to save this Monarch habitat,” says Oak Heritage Conservancy Executive Director Liz Brownlee. Over 100 families, individuals, organizations, businesses and foundations contributed. Donations ranged from a few dollars to thousands of dollars. We reached the $250,000 mark on Monday, Dec. 18, just in time for the auction. On Tuesday, Dec. 19, we successfully bid on the property. “The auction was a real nail-biter,” reports Brownlee. For almost two hours, Oak Heritage Conservancy bid and counter bid. In the end, we purchased 80.6 acres of Monarch butterfly habitat for $253,000. More recently, Oak Heritage Conservancy purchased an adjacent 4 acres, again with support from the Foxes, to bring the total preserve to almost 85 acres. We look forward to opening the property to the public later this year. If you’d like to see the property during peak bloom, we recommend going in July and August. We’re hosting a butterfly walk on August 25, 2018 to welcome our members and anyone from the public to enjoy this new preserve, and we hope you will join us! Directions to Monarch Meadows Nature Preserve.